The Department of Accounting and Finance at Grove City College prepares students for a lifetime of learning and for careers in public or corporate accounting, corporate finance, or financial services. Students choose from a broad course selection that includes classes in financial accounting and reporting, managerial accounting, accounting information systems, auditing, taxation, government, and non-profit and cover topics such as investments, corporate finance, financial planning, capital markets, and financial modeling. Upholding a long tradition of academic excellence, Grove City College consistently places among the top colleges in Pennsylvania and across the nation in achieving exceptionally high CPA exam pass rates. The College’s accounting graduates ranked 9th in the nation on the 2017 CPA examination among medium-sized programs, according to the National Association of State Boards of Accountancy, which oversees the test. It is the fifth time in six years that the College’s graduates are in the top 25 nationally. According to recent studies, the area of accounting ranks as the 7th most popular major among U.S. college students. This should come as no surprise as a degree in accounting opens up a wealth of job opportunities, ranging from government work, to careers in finance or corporate management, to entrepreneurial opportunities, and more. The basic tool and language of business, jobs in accounting require a high level of technical skill combined with strong ethics. An area well suited for lovers of math and individuals with high moral standards, this list seeks to offer what we consider to be the best options among Christian colleges and universities for pursuing your degree in accounting. The mission of the business programs at Grove City College is to prepare students to become effective and ethical leaders in business as well as in society as a whole. The Business program includes the Departments of Accounting and Finance, Marketing and Management, and Entrepreneurship. 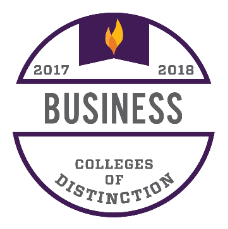 All majors in all three departments are accredited by the Accreditation Council for Business Schools and Programs (ACBSP), a premier accrediting agency in business-related academics. The Department of Accounting and Finance at Grove City College offers students the freedom to conduct meaningful, relevant research alongside experienced and accomplished faculty.